Being a northern Germany native, the term “Beluga” was mostly associated with the large Airbus transport planes that would pass over my parents’ garden on their approach to the Airbus facility in Finkenwerder, Hamburg. Unbelievably large airplanes, with whom I had trouble wrapping my mind around how something so large could even fly. For a long time, I had a similar sentiment towards helicopters. Once in a while you may see a rescue helicopter passing over the city, but barely ever is there the chance to get close to one, not to mention fly along. Work on Polarstern however is completely different. 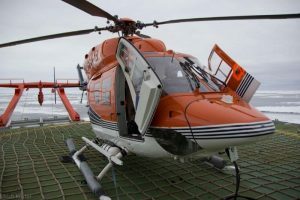 The helicopters D-HARK and D-HALT are part of the scientific equipment, just like the CTD or the fishnet, that is being used on this cruise to analyze the population of Polar Cod that lives in this region. Multiple times a day you hear a loud buzzing sound and seconds later see a blue-orange helicopter passing by your office window. The main workhorse is the BK 117, being flown by Lars Vaupel and Jan Kendzia, two pilots of the German “Heli Service” company. Together with the mechanics Jan Gregalis and Roland Richter they maintain all science work that requires the helicopter. Among other things, so called melt ponds are studied. When temperatures rise during the summer, small ponds form on the sea ice that grow over time and sometimes even melt through the ice completely. 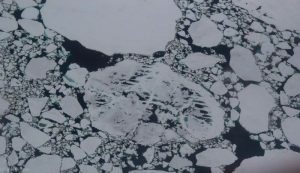 As they are much darker than the surrounding white snow and ice surfaces, they can absorb more incoming solar radiation and therefore accelerate the melting of sea ice. In order to understand and quantify melt ponds and their optical properties, two cameras were built into the BK117 that can be used to scan melt ponds from a height of 2000ft. Due to the weight of the cameras, aside from the scientist maintaining the measurements, a so called “ballast person” must fly along in the copilot’s seat to ensure weight balance. As expected, this is a spot that is easily filled. On Monday, the 26th of June it was finally my turn when the responsible scientist Gerit Birnbaum approached me and asked if I would like to fly along. I didn’t get much time to think (not that I needed it), since takeoff was scheduled for half an hour later. Luckily, check-in and luggage control are not necessary. However one has to dress up with a survival suit for safety reasons and a helmet with built in radio for communication on board. After a safety briefing I had finished my personal preparations. By that time, the helicopter deck is already a busy place. The rotors have to be unfolded and gas has to be filled up according to the flight time. Meanwhile, I could already take a seat on my window seat and get used to the surprisingly small inside of the helicopter. There is not really any leg space since the pedals for the rear rotor take up a lot of space in front of the copilot’s seat. That is quite acceptable once the engines are started and the rotors start turning. 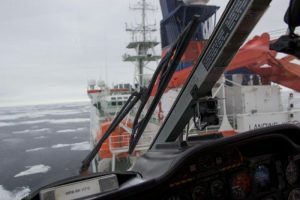 Lars Vaupel lets the helicopter take off with unexpected grace and within minutes Polarstern is nothing but a small dot on the horizon. 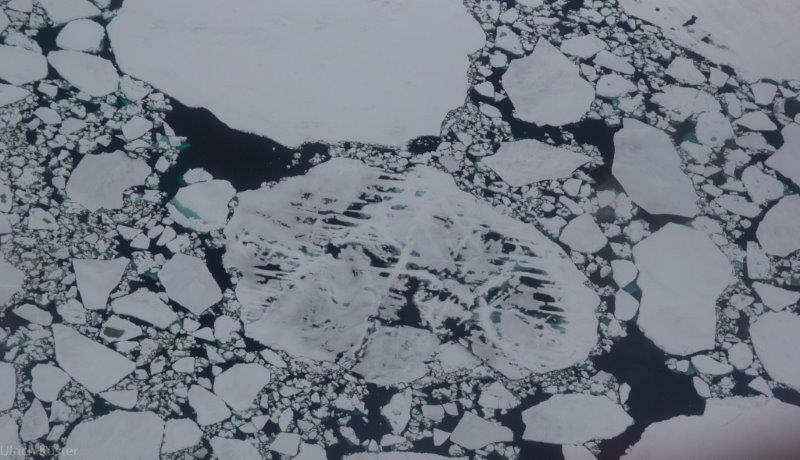 During the two-hour flight, ice- and ocean surface are measured constantly with additional loops over certain spots. The ice from above is anything but just white. The countless melt ponds are mostly turquoise, often deep green if algae live in them. The highlight after around an hour of flying were multiple schools of exactly those Beluga whales that until then I had ironically only known in relation to air flight. 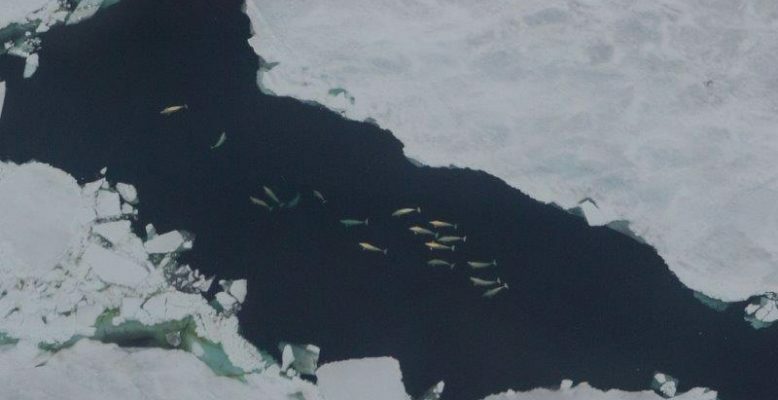 In groups of over ten animals they were swimming in formation in open water around an ice floe, just as if they were deciding on where to swim next. Their beige skin seemed almost unfitting for this habitat. It did not appear as if our overflight bothered them too much. Shortly after our return began and just as smooth as the take-off, we landed on the helicopter deck of Polarstern.